One or two weeks ago I found myself at Cambridge Naturals- and I was very happy to find that they did not only have Katalyst Kombucha and GT's as I remembered. They had those two brands, Kombucha Wonder Drink, and High Country Kombucha Tea as well! And although it's hard to see in the picture- just like the Harvest Co-Op, Cambridge Naturals also sells Katalyst Kombucha in a 1/2 gallon jug! (The jugs are in the bottom right of the picture, partially obscured by the boxes). Later on that week I was at the Harvest Co-Op, and made another good finding: Katalyst Kombucha now sells their kombucha tea in 16 oz resealable bottles! The only downside is that they used to sell 12 oz bottles of kombucha tea for $2. 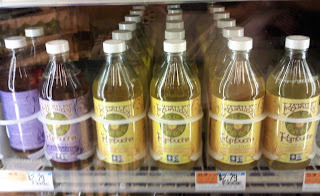 Now at the Harvest Co-Op, they sell 16 oz of kombucha tea for $2.79. $2.79 is still the cheapest price I've found for a 16 oz bottle of kombucha tea in the area, though, at regular price (I think)! And yay for reusable bottles! Oh, and did I mention that GT's now uses plastic bottle caps for their kombucha tea? No more worries about rusty bottle caps->these bottles are also wonderfully reusable! Awesome. I've seen this brand for $3.49 regular price at Whole Foods and the Harvest Co-Op. 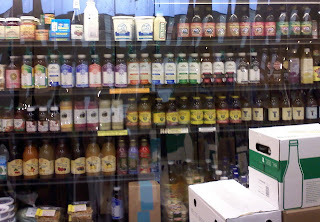 To top it off, I found another location that sells Kombucha Tea- Oh Naturale in Boston's North End (28 Parmenter St.). Oh Naturale is a small health foods store, and sells High Country Kombucha and GT's Kombucha Tea (you can see them in the picture in the bottom three rows). Unfortunately, Oh Naturale sells kombucha at the higher price of $3.99 per bottle. And if you haven't already, read more about other places in the area to buy kombucha tea in my old post. For those of you who have Monday off, enjoy the long weekend!!! Sorry for the late recap, but last week final exams hit. Thankfully, all my finals are over and I'm very excited for summer!!! I would first like to thank everyone who attended my workshop at the 2009 Boston Skillshare on April 19th! I was very impressed with the turnout, and you were a great audience! Although Keith Person was not able to hold his workshop, I was happy to be able to give out some mushrooms for him! Thanks, Keith! 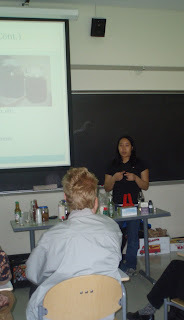 I would also like to touch on the Continuous Brewing Method that I mentioned at the workshop. 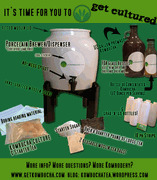 The Continuous Brewing Method is an extremely easy way to ferment kombucha tea! It involves drinking/drawing off 10-20% of your KT brew daily, and then replacing the amount that you drank with sweet tea (every day, every other day, or every three days) (1). You want to stir the brew to mix the old ferment with the new sweet tea, so the bacteria/yeast are distributed throughout. Stirring will bring in more oxygen that the bacteria need to do their job. Because you are disturbing the tea every time by stirring, no new babies will form. This is not a problem at all, unless you were looking to have extra SCOBYs on hand or if you wanted to give some SCOBYs away. If this is the case, you may want to use the traditional brewing method. Reminder: the key is to do everything proportionally. You can make more/less sweet tea, and store extra sweet tea in the fridge for a few days so that you won't need to brew it everyday. Also, please remember that your sweet tea and your brew/mushroom need to be at the SAME TEMPERATURE! Otherwise, you will be increasing the risk of your SCOBY getting a mold infection. 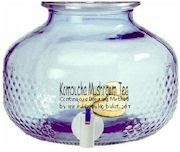 A beverage dispenser- Happy Herbalist suggests that the amount of KT you drink daily should be 10-20% the size of your container. 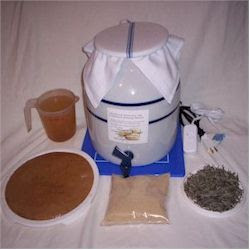 One way to obtain a beverage dispensor for continuous brewing is from online, such as from Happy Herbalist and getkombucha.com. Boil the water- not for too long, because the bacteria need the oxygen that's in the water. Add the tea- steep for ~15 minutes or follow the tea's specific brewing instructions. Remove the tea bags/tea leaves. Add the sugar and mix until it is all dissolved. Let the sweet tea cool down to room temperature (such as by leaving it overnight). Draw off 10-20% of the fermented kombucha tea from your brewing container, and then add the sweet tea (which should be around the same amount of tea that you drew off). Stir the fermented tea and the sweet tea. 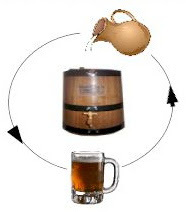 What's great is that the continuous brewing method is really simple and easy! Because you are starting with ~80-90% kombucha tea and ~10-20% sweet tea (vs. the other way around), your ferment is ready within ~24 hours (vs. being ready within 6-14 days). And you don't need to be exact, either- you can skip/overdo some days! In order not to make this an overwhelming post, I will talk about some advantages and disadvantages of the continuous brewing method tomorrow! Thanks for visiting my blog, and please feel free to leave a comment if you have any questions!